WILLEMSTAD – Tensions are running high between the coalition partners MAN, PAR, PNP and Pueblo Soberano (PS). This after the PS came with the initiative, during a parliamentary meeting, for a temporary committee on Smart Zoning. This initiative received the support of the opposition parties MFK, Korsou di Nos Tur, Marilyn Mozes MP and the Independent MP Edward Braam, which is a majority in parliament. 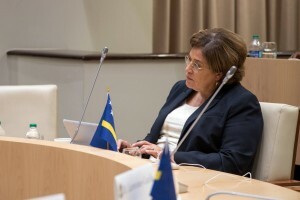 The coalition partner PNP and its Minister of Spatial Planning Suzanne Camelia-Römer are against this proposal and even qualified it as a “trust issue” since the Minister is already working on the changes to the “Eilandelijke Ontwikkelings Plan” (EOP), the Island Development Plan. The Minister has explained several times that the process to revise the EOP is long and it will need the help of local and international experts. The Pueblo Soberano MP Cijntje said he regrets that the issue has caused so much discord and resistance for something as interesting as smart zoning. “The Minister wants a more efficient public transport and affordable housing. This is the way we should go about it. Curaçao was paralyzed for 20 years. The EOP was a moratorium on construction,” said the MP. The MP indicated that his proposal is not to keep the government or the Minister out but it is to benefit livable neighborhoods.